Harker has had a banner year in the athletics department with 17 students recruited by colleges and four planning to play in their sports as walk-ons. They are: Michael Amick, UCLA, soccer; Kevin Cali, De Anza or West Valley, baseball; Chris Chang, Columbia, crew; Keri Clifford, Santa Clara, water polo; Isabelle Connell, Pepperdine, track & field; Siobhan Cox, Stanford, soccer; Karan Das-Grande, Connecticut College, water polo; Ashley Del Alto, Briar Cliff University, softball; Patricia Huang, Amherst, golf; Daria Karakoulka, Cal Lutheran, tennis; Sierra Lincoln, Cal Tech, water polo; Maverick McNealy, Stanford, golf; Sumit Minocha, Stanford, track & field; Nikhil Panu, Johns Hopkins University, basketball; Andy Perez, UC Santa Barbara, soccer; Daniza Rodriguez, Whittier College, basketball; Arhum Siddiqui, Brown, squash. 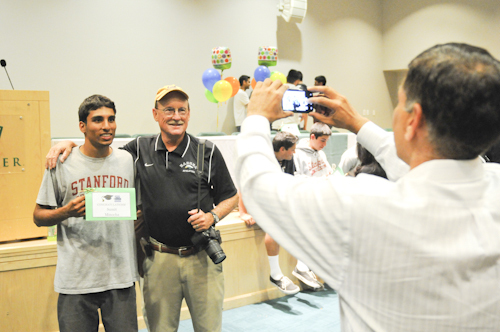 Harker held a brief gathering to celebrate the athletes and their committment to their sport just prior to graduation, attended by parents, coaches and players. To these Harker stalwarts we wish the very best of luck in their academic and athletic careers. Go alumni Eagles!